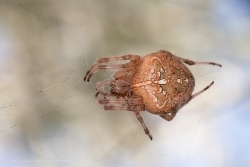 Araneus diadematus is the scientific name of one of the most common spiders in Europe commonly named European garden spider or diadem spider or cross spider. The name cross spider derive from the typical cross dorsal light spots. 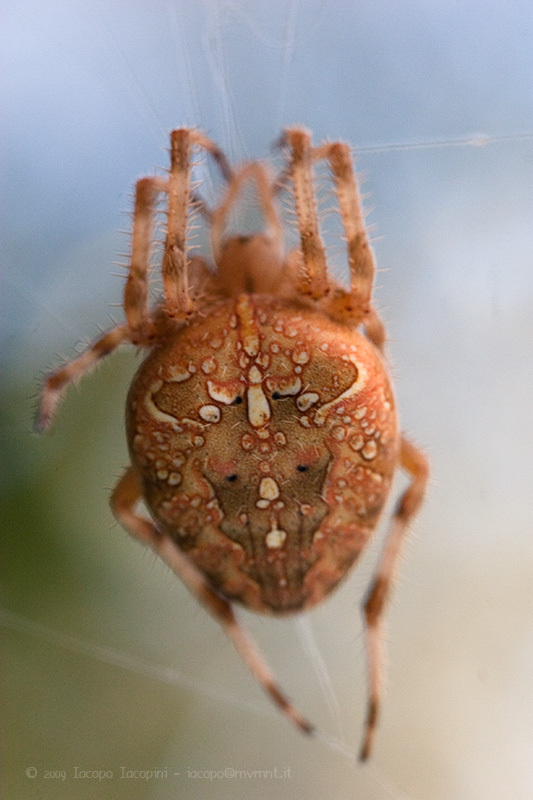 The base color and shading can be different from spider to spider and may vary from pink to light or dark brown. 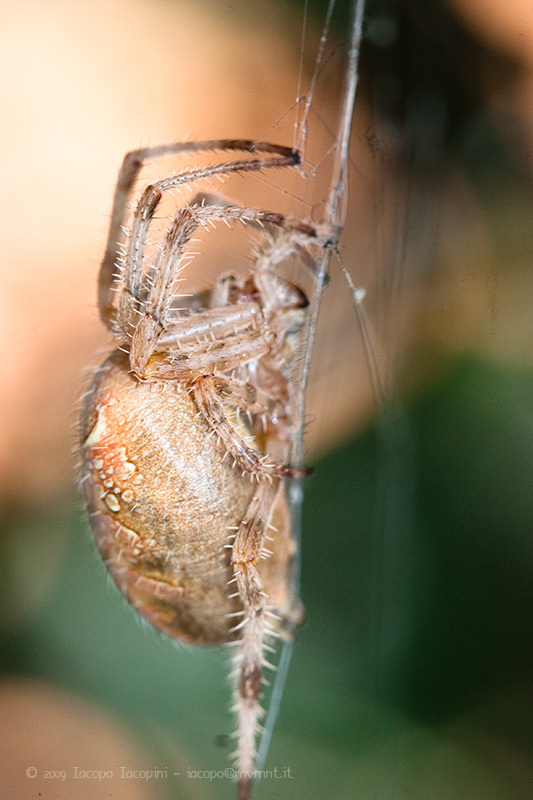 The size of this specie is not negligible but the body does not usually exceed 2-3cm (1-1.5in) in length. 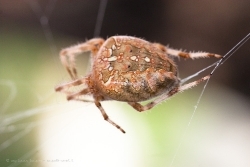 The cross spider tends to flee when disturbed by humans for which is not at all a threat. The sting of this spider is very slight tingling, less than the pain caused by a bee or a wasp. 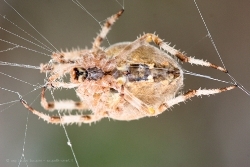 The spiders of this specie spend his time resting on the center of a web of silk orb that can reach the size of over 40cm (16in), which besides being the home is also the mechanism used to trap insects of every size to eat. 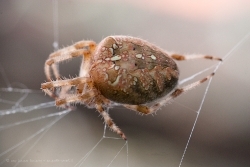 The spider creates the web in the air usually developed between the branches of large trees. The spider spent the time listening with their feet to vibrations generated by insects that are trapped in the web. Once intercepted an insect of appropriate size the spider goes to the prey that is immobilized and wrapped in a cocoon of web and not eaten immediately. 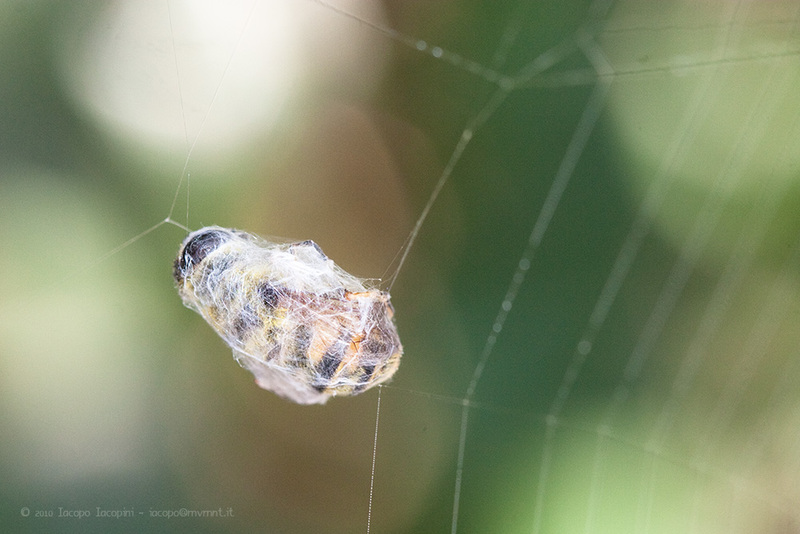 Every night the spider eats the whole web comprehensive of the preys captured the day before in order to reassume the proteins and energies to weaving a new web for the new day. Description: The European garden spider (Araneus diadematus) also known as cross spider is one of the most common specie of spider in Euorope and derives its name from the typical shape of the spots on the back. Tags: Araneus diadematus, cross spider, diadem spider, european garden spider, macro, macro photography, spider.